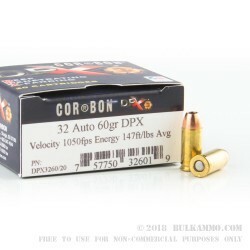 This 32 ACP cartridge by Corbon sports a 60 grain solid copper hollow point projectile. 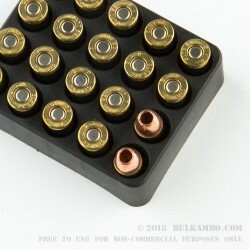 Being made of solid copper means that this bullet won’t rust, corrode, or most importantly pollute the environments where you fire it -- meaning you should get along just fine in areas where state or federal law has banned the use of lead ammunition. Although copper does not expand as easily as lead, this bullet still expands very well thanks in great part to the larger opening in its tip. 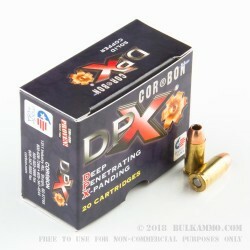 Copper’s superior strength also means that this bullet will penetrate beautifully to provide the kind of stopping power that you can depend upon in a self-defense situation. Even thick clothing will provide inadequate resistance to remotely dampen this bullet’s performance. Corbon dispenses with any novel manufacturing processes to focus solely on their tried and proven methods. They make their ammunition only with high quality components, and back everything they sell with a 100 percent satisfaction guarantee.